​And like that, it was August. Time has a way of sneaking up on you. One moment you're happily browsing through your local rec center's spring/summer programming guide, thinking about the long and warm days ahead of you, and the next it's August, and the final days of summer extend only as far as a few short leaps on the calendar. I know that it's only the second week of August, and that there's still lots of time for lazy days at the lake and lemonade on the porch. But in many places, including my own city, it's starting to cool down. For many reasons that's great. Fewer forest fires. The oncoming fall, when cozy sweaters and hot chocolate will fill in the hole that Summer's coconut sunscreen and blooming gardens left behind. But for pool owners, the end of summer means something else: the end of pool season. I have some good news for you, something that will help you extend your pool season and keep the last vestiges of the summer's heat in your pool: Heatsavr. ​​You may have heard before that Heatsavr will help prevent up to 50% of your pool's evaporation, and thus up to 50% of your pool's heat loss. But seeing those numbers and understanding how they will affect your pool are two different things. Let's say you have an average heat loss of 6 degrees each night, but that's fine because in the summer your pool gains back that 6 degrees during the day, plus or minus a degree here and there. As summer wanes and less heat makes it into your pool during the day, that overnight heat loss will begin to add up. If you're only losing 3-4 degrees per night, however, and you're also able to retain more heat during the day, then your pool will stay at a swimmable temperature longer. And all you have to do is add a little liquid to your pool once or twice a week! If there were an option for me to buy a product that would magically extend the summer, I would. And maybe they'll create one someday. But for now, the closet you can get to that is Heatsavr. 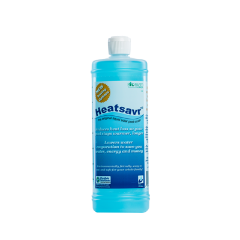 Summer will ends when it ends, but with Heatsavr you can keep swimming as long as possible.